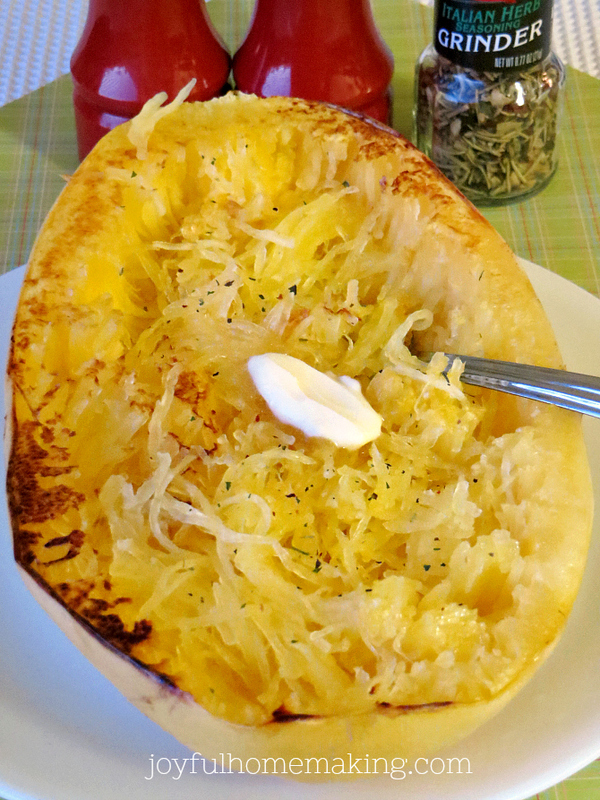 If you’re trying to eat more healthy vegetables, or trying to reduce your refined carbohydrates, I have a delicious suggestion for you that my mom and sister introduced me to: it’s spaghetti squash! 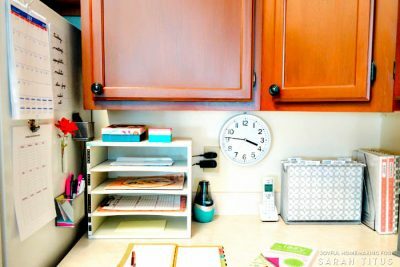 It’s become a favorite addition to our dinners lately, because it’s not only scrumptious, but super duper easy and versatile too! 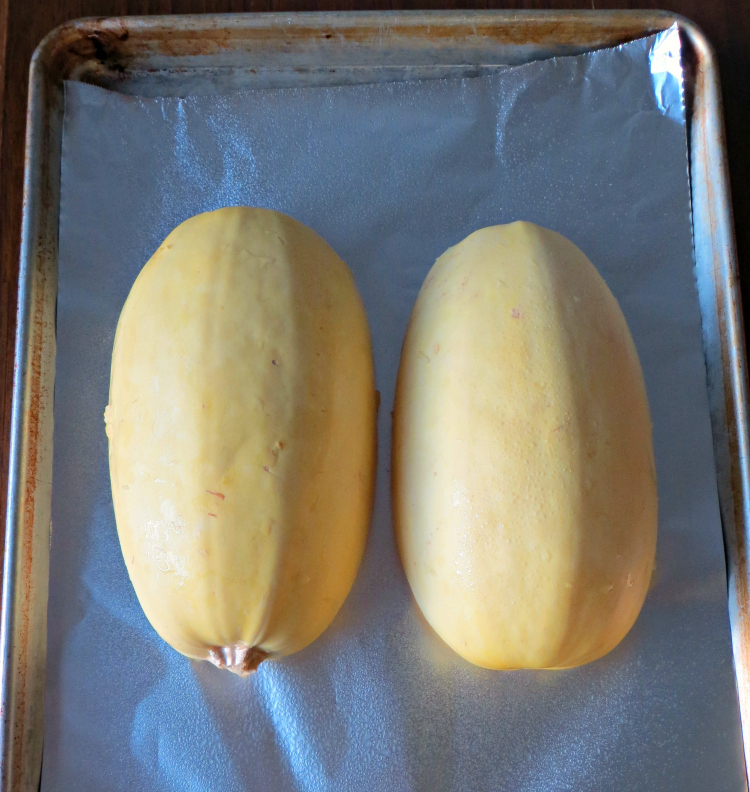 Now I have never been a fan of yellow or zucchini squash. My parents would grow them in our garden when I was growing up, and even though my mom fixed them all different kinds of ways, I just tolerated them. 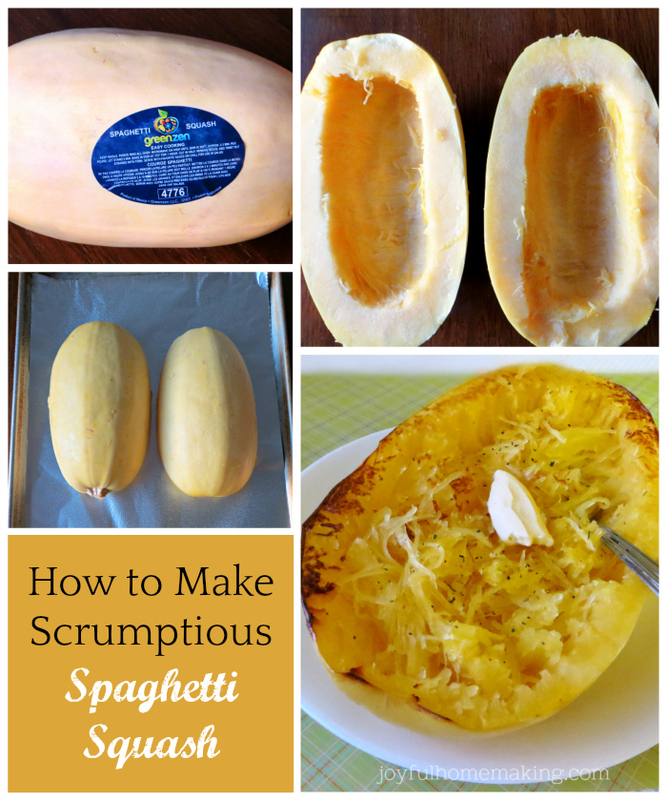 If you’re in the same boat as me on squash, I hope you’ll give spaghetti squash a try, because it’s a whole different taste and texture, and you can use it as an alternative to regular pasta. 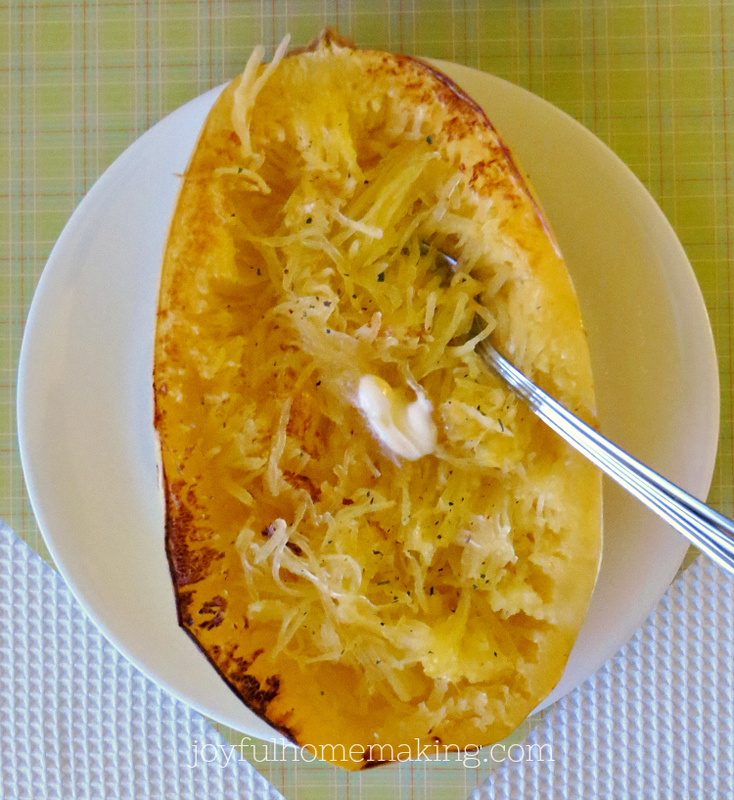 Spaghetti squash can be a side dish or the star of your dinners because there are so many different ways to enjoy it, depending on what your favorite toppings are. 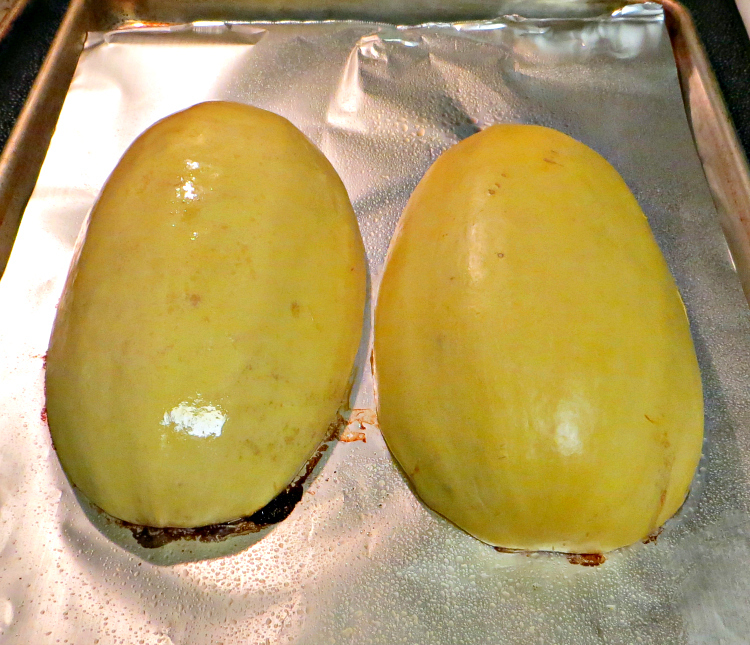 You can find this squash in the produce section of the grocery store, and this is what they look like. To prepare one, take off the stickers, wash the outside, and cut in half with a large strong knife. 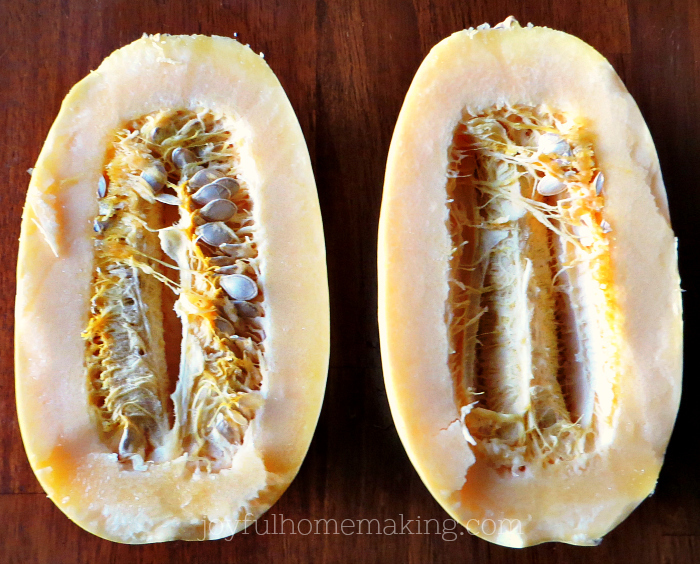 With a large spoon, scoop out the seeds and pulp from the inside. 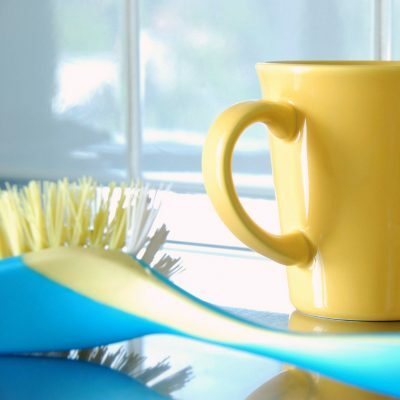 Now a lot of people sprinkle the insides with olive oil, but I just give it a quick spray with cooking spray to save on fat and calories. 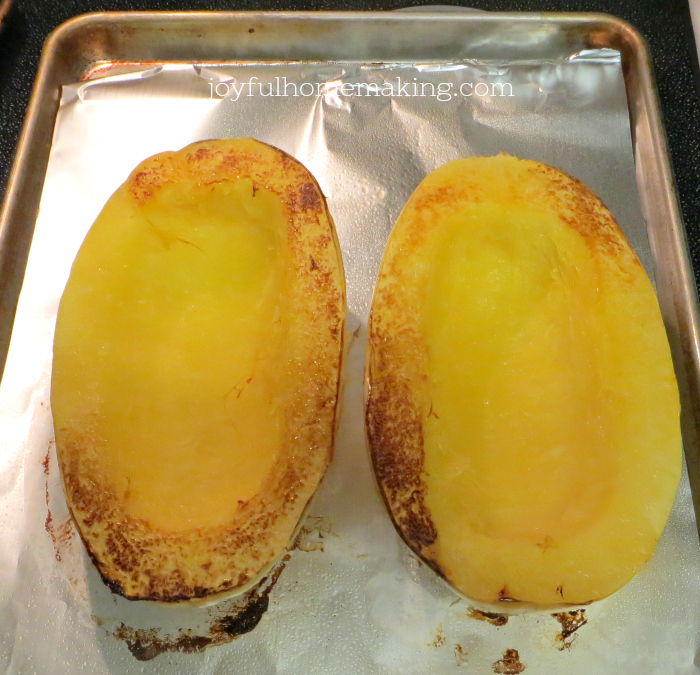 Lay them face down on a greased piece of aluminum foil, and bake in a preheated 400 degree oven for around 45 minutes. 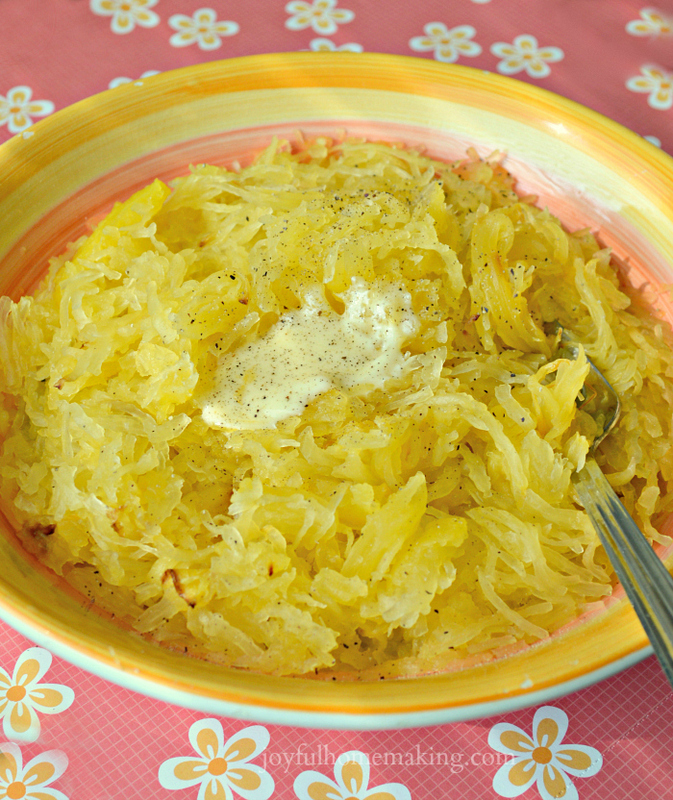 If it’s all nice and tender, and when you run a fork top to bottom on the inside, the strands easily pull away, then your spaghetti squash is done. 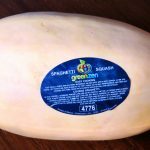 Now using a fork, just scrape the insides of your spaghetti squash, and it will start to come up in lots of strands like spaghetti. 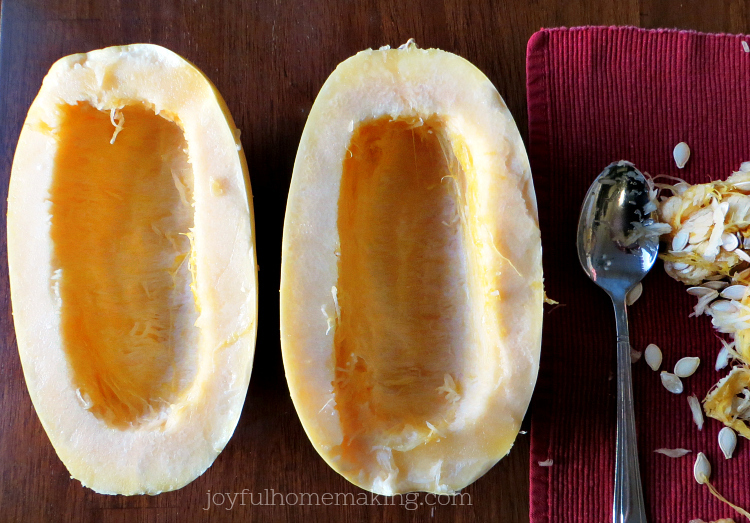 Then you can eat it right out of the peel, or scrape it all out, and serve it in a bowl. I like to top mine with a dab of butter, garlic salt and Italian seasoning! Yum! 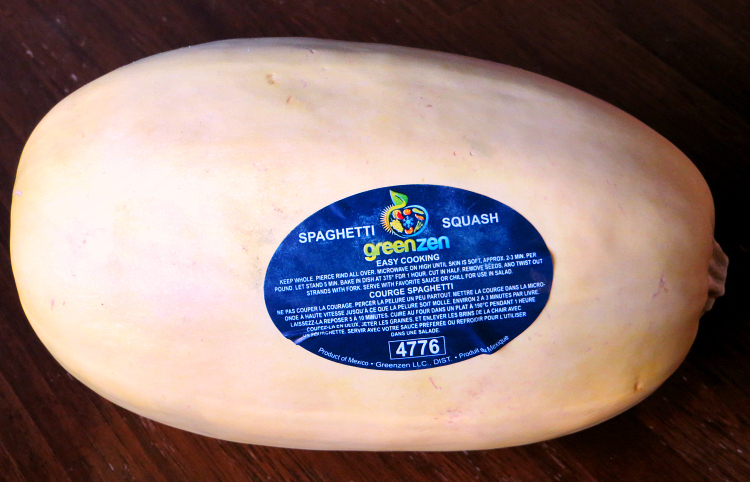 Now using a fork, just scrape the insides of your spaghetti squash, and it will start to come up in lots of strands like spaghetti. Then you can eat it right out of the peel, or scrape it all out and serve it in a bowl. I like to top mine with a dab of butter, garlic salt and Italian seasoning! I’ve been really trying since the beginning of this year to add lots more veggies and a lot less fat to my diet, so that’s why I enjoy mine with a tiny bit of butter and seasonings, and it’s delicious! 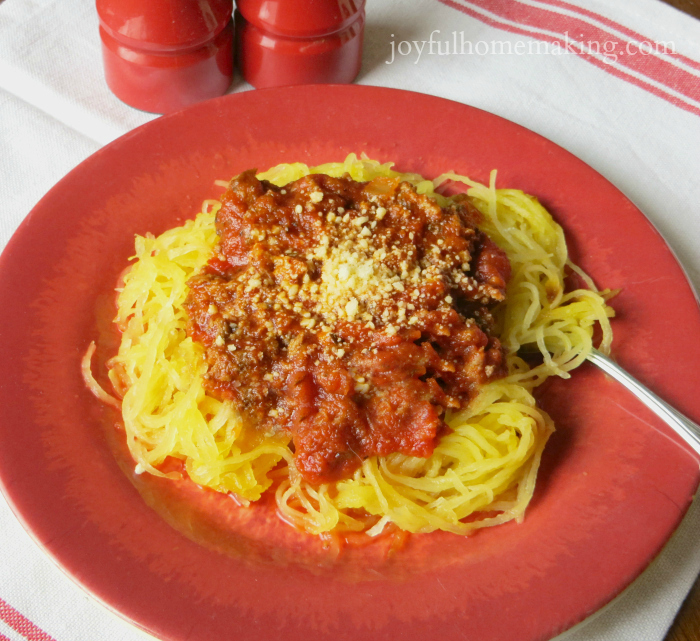 It’s yummy with pasta sauce too.